Magnetism is an invisible force. It can affect metal materials, such as iron or steel, but does not affect non-metal materials like wood, paper, or plastic. 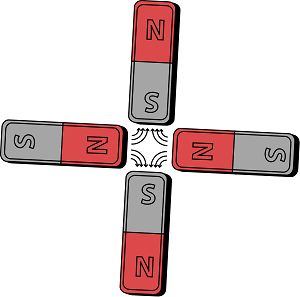 All magnets have two sides. One side is called the north magnetic pole, and the other is the south magnetic pole. Magnets attract when a north magnetic pole faces a south magnetic pole. If two like poles face each other, they cancel out each other’s magnetism and do not attract. The space around a magnet is known as a “force field.” You can see this force field by using metal filings. When you put metal filings between opposite magnetic poles, the filings move to stretch across a field of attraction between the two poles. Compasses are the one tool that rely on magnetism. They work due to the gigantic magnetic field in the Earth’s core, which acts like a magnet to the compass. Because of this, the arrow of a compass will always point toward the direction one is facing. Though there will always be a magnetic pull from the Earth, magnets can lose their magnetism. This happens when they are exposed to heat or hammering, which breaks them down. Magnets have a number of important functions. They can even make electricity! Without them, compasses and other important materials would not work. So, next time you hold a magnet, stop and think about the power that lies in your hand.